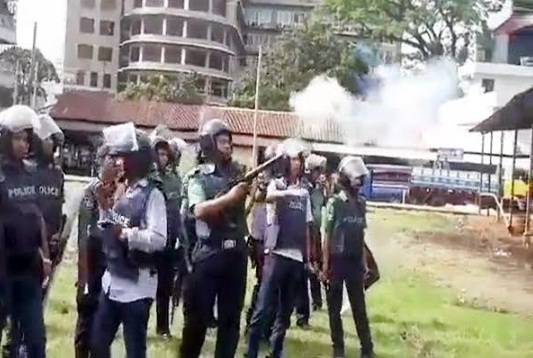 Police on Saturday foiled a demonstration of Chhatra Dal by resorting to firing on the rally leaving 30 activists injured at Kazir Bazar area of the city and arrested at least 20 leaders and activists of the organization. Among the arrestees are former joint secretary of Sylhet Metropolitan Chhatra Dal Chowdhury Mohammad Sohel, former joint Secretary of Sylhet District Chatra Dal Afsar Khan, Former leaders Anowar Hossain Manik, Raihan Chowdhury Rahi, Topu Ahmed Khan. According to locals, leaders and activists of Sylhet district Chhatra Dal, a student wing of BNP, gathered at Kazir Bazar area for a protest rally demanding to free the BNP Chairperson Khaleda Zia. When the rally started from the Parkview Medical College at Telihaor area, police dispersed the demonstration with firing and tear gas shell. Sub Inspector Anowara Begum and Sub Inspector Anup Kumar Chowdhury of Kotwali Police Station confirmed to UNB that the arrests took place. Sylhet District BNP General Secretary Abdul Ahad Khan Jamal said police also fired blank shots and tear shells at the residence of BNP chairperson's adviser Khandaker Abdul Muktadir. Muktadir claimed that the organization took permission from the administration for the demonstration in the city and prepared for the demonstration after receiving the permission from them.